This past week I have worked more, off and on, on the Z-Band server scripts. I've gotten them a lot more polished then in my last update. The Leaderboard is functioning more like a Leaderboard now, and sorting in descending order based on wins. Both the registration and score updating scripts have been fully written, and rewritten (compy crash with unsaved data ftl). 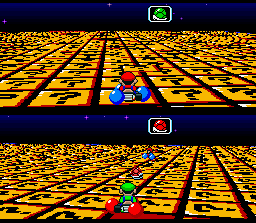 For most of my developing and testing of the scripts they just supported Super Mario Kart. I thought adding support for other games was going to be a bit more trouble, but I did all that today without much issue. As they all stand now, their completely functional. I still have to tie them into a phpbb database to use account info. As such, I don't have proper password support implemented. Other then that, I have to add a few checks to make sure nothing is tried to be done that isn't expected. Like sending an update for a game your not registered as playing, a score mismatch between players, etc. I'll probably iron that stuff out over the next week. Then maybe consider recoding a new version of the dll to support these, or implementing what I can of a recoded dll into a version of the stand alone client. Other then that, this week I worked on my blog layout a bit. Polishing up some of the template code to suit how I want it. And adding/changing some images and colors. I brushed up on Photoshoping (formerly just PaintShopPro for me) and made the current background and logo. I made several other backgrounds as well, all pretty nice. This one was just closer to what I wanted. I'm not totally happy with the logo. 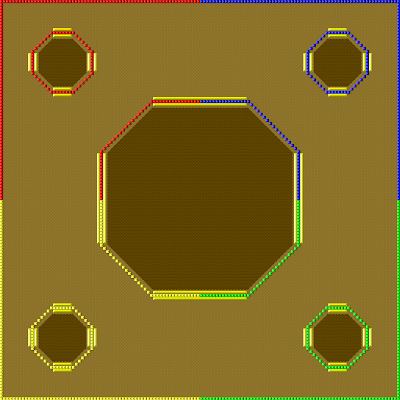 I couldn't summon up much inspiration for it, and it seems very plain. With informational updates for most of my more major projects now posted to preserve their history, I'll now start posting news about what I'm working on and any progress with my projects. Out of boredom with nothing to work on, I recently started learning php. My past web development experience was mainly just with html, and I wasn't all that great at that. I've been told php was easy if you know C++ and had been meaning to give it a try for a few years now. It seems that it is in fact easy. Its like a good blend of C++ and mIRC scripting styles when it comes to familiarity for me. I'm still just at my beginnings with it, but I can probably see myself getting more used to it fairly easily. Really its more pointed out how lacking and outdated my html skills are, as dealing with html and CSS seems to be much more confusing and messy. As a learning project, I choose to create a much needed page for editing the header EQCLP uses located on the server. This header is downloaded every time a user runs EQCLP as its first act, and tells it certain basic info. Mostly just what files are available to be downloaded by it, and the CRC's of those files so it knows if it has the most up-to-date ones locally. There are a few other options as well. Having a web based editor for this header is much nicer then having to edit the file manually, as editing it manually could cause serve issues if done by someone who doesn't know what their doing, or someone makes a slight mistake. 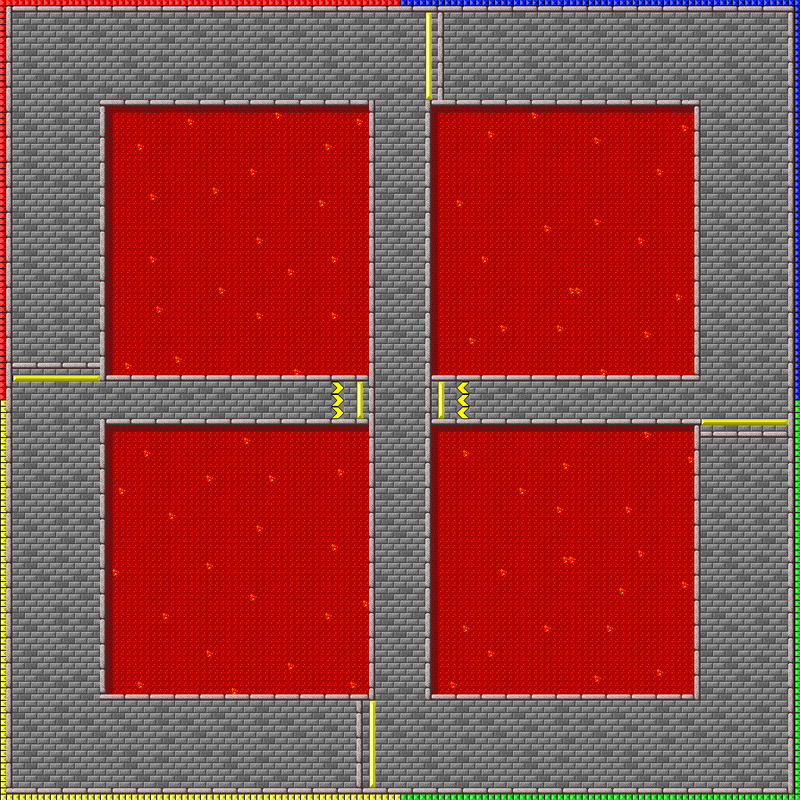 There is probably a little more I can do with the editor, but I basically finished quickly. Still wanting a project to help me learn more, I talked with Yeahlight of EQClassic some about possibly making some scripts for that. But nothing could be worked out due to either my lack of interest, lack of php skill (I don't want to take on a project TO involving), or lack of need at this point. Oddly enough, I found a good learning project buried in a failure of one of my older projects. Z-Band never saw the light of day in part because of my lack of interest or inability to write a server for it. Without a server, something like Z-Band is pointless and only serves to be something "neat". I've been working on that on and off for the past few days now. I have it set it up to access a MySQL database for any match/scoring info. 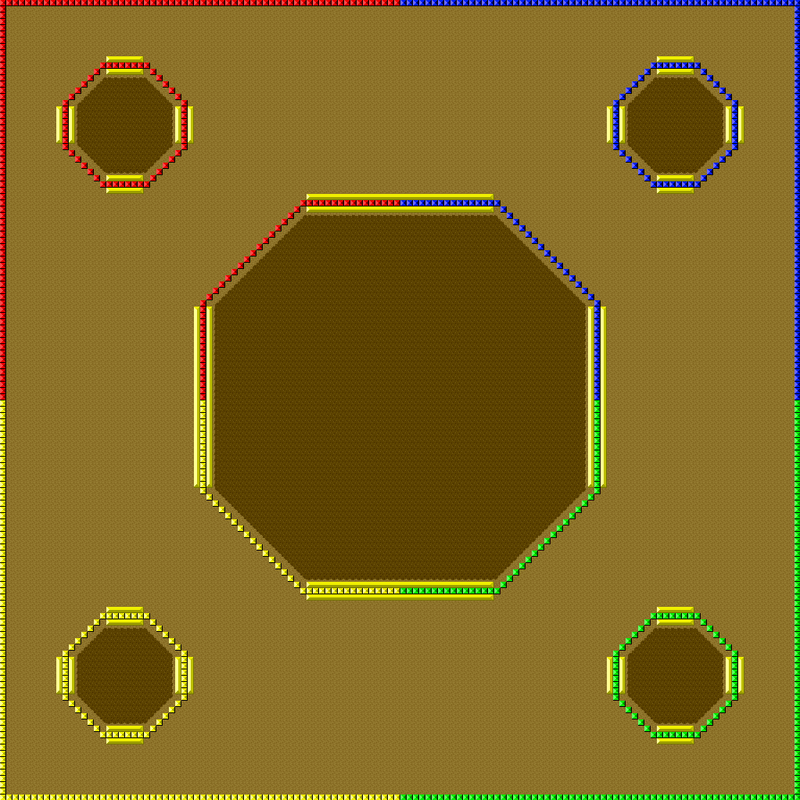 A basic scoreboard was the first thing I made. I then started working on 2 other aspects of it, being a match registration script so the server knows a match is going on and between who, and a score update handler to receive players scores as they earn them. I'm not near finished with either yet, and am still running into my share of bugs due to my inexperience. But their coming along, and since it relates to my favorite project, its fun and interesting. In other news. I got some of some older links to my past sites changed/redirected to here. Mostly just the http://z-net.ne1.net url, and some links from websites. Hopefully I'll get a little more traffic here, and maybe some visits from some old friends. Z-Band is my favorite project, but it never saw the light of day sadly. I started it after Z-Net 1.0 was officially released. 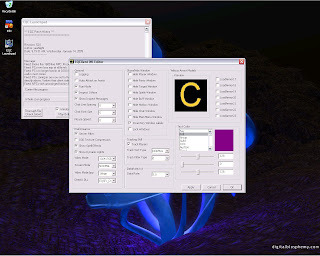 I think it was technically my first project using C++, so I was still learning as I was making it. At this time, my inexperience was certainly what hindered this project, as I couldn't figure out how to get it to work exactly like I wanted. Before I go on more, I''ll describe the intent of the project. 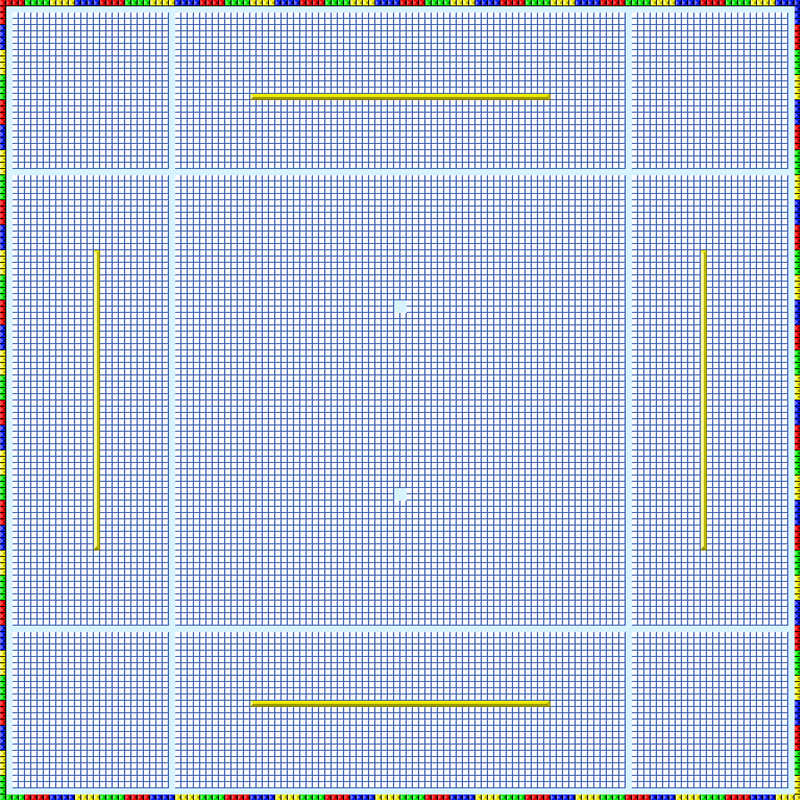 It was to be a mIRC dll designed to automatically track scores from Z-Net users netplay games, and automatically submit the scores to a IRC bot for tournaments and scoreboards. I derived the projects name from the, ahead of its time, X-Band modem for SNES. Now, in 2004 I got stuck on the project. I couldn't get it working properly like I wanted it as a dll. I was able to get it working better as an exe however, but didn't like that. I produced a spinoff version of Z-Band called "Z-Band - SMK". The notable differences being that is was an exe at one point, and a dll at another. Also it didn't send its scores to a bot, but just updated the channel with score changes. This spinoff version was more of a proof of concept, that the idea could work. Still though, while I proved the idea could work, it had it's issues, and I couldn't advance the project along further towards getting released. So the project died out. Years later when I started the Z-Net 2.0 project, my C++ had improved by then and I gave Z-Band another look. I was now able to fix the issues I had with it years before. 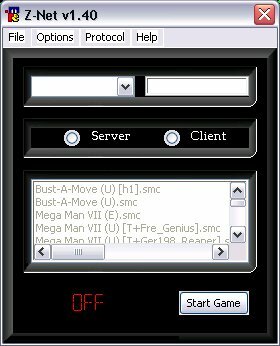 I got it working perfectly, and added support for more games including Street Fighter 2, Gundam Wing Endless Duel, and Bust-A-Move was almost finished. This time however, the issue I ran into was different. While I did design a bare-bones server bot, I realized I didn't want to invest the time into developing a more proper one. No one else stepped forward to offer to do so, so Z-Band never progressed further. I wasn't interested in developing a bot, cause one, I'd want to do it properly, and that would be to involving, and two, I just wanted to work on things more directly with Z-Net. It was enough of a project itself. The close tie in of this project to Z-Net itself, of course also played a factor, as soon after I came to a conclusion to end development of Z-Net all together. No screenshots of this exist, but shouldn't be needed. And the project was never released, except maybe the SMK version. I have no plans to release any version now, and if the project were ever to continue forward, it would be a part of a stand alone client or possibly a stand alone client all in itself. After production had stalled for a while on EQC Launchpad, I grew bored without any interesting projects to work on. I started desiring to want to work on Z-Net again, despite knowing full well from my experiences, such a project would be a waste. I never liked the fact that I failed so miserably at creating the stand alone client years earlier, and it gnawed at me that due to my recent experience developing EQC Launchpad, I know I could could make it now. From only my code, and it wouldn't take that long. In fact, looking at the only successful project of its type, zbattle, I still maintained that it was ridiculous how simple/bland it is, that it hadn't seen any improvement in the vast ways in which it could be done so, for years, and that even with my low skill I could write that program in a week! It was a silly statement I made to myself. Or so I thought at first. As I thought about it for a while, I realized more and more that it was possible, even for me. Eventually this thinking got to me and I said "What the hell!? ", deciding that I will give it a try. I still had no plans of trying to make a program to gain a following in such a scene, as I could make it as perfect as it can be, and it still wouldn't attract any new users, or any away from zbattle, no matter how many extra features it would have, or what types. I just needed to prove to myself that I could do it. So I started developing a new stand alone client, with no intention of releasing it. In part, as not to get dragged into a futile competition, and in other part cause I was going to make an exact clone of zbattle. 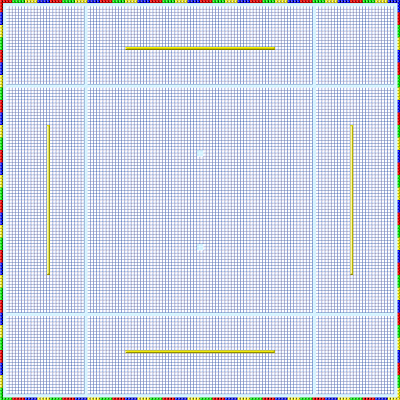 No more, and no less features, mirror image GUI. While not exactly like taking source from a project, and claiming its yours, making a project that's an exact clone of another and releasing it seems like bad form to me, and close enough to theft. While I say it would be an exact clone, I mean only visibly in terms of interface, and in terms of features. Obviously, while I could, I wouldn't name it the same. And I went a different route in terms of the server of which the client connected to. One of the biggest cons to the zbattle project that prompted me to even start Z-Net years before, was the reliance on a central server that can, and did get hacked, and would often go down for long periods of time. Also, using a server such as zbattle costs money. That money would be coming strait out of my pocket if I were to go that route, something that is not very appealing to me. In the past with the Z-Net mIRC script, I believed IRC was the best answer to that. There are tons of IRC servers, completely free to connect to and run channels on. If a hacker decided to go after one, the program could just use another. 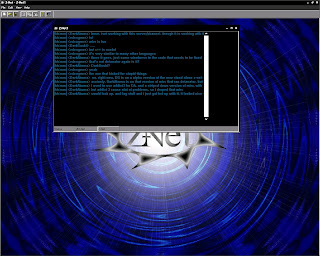 Even the first Z-Net stand alone client used IRC. Why not use it with this one, to help prove the point, and prove to myself the idea could work? I always thought most of the communication between users clients could be handled just fine using IRC, and in a clean way that could allow the channel to remain free and clean as a chat space. But I wasn't sure about every aspect. Most that I wasn't sure about I figured out with the Z-Net 2.0 series. Could I figure out the rest, and support a channel that users not using Z-Net and instead using a regular IRC client to just chat, cleanly? I was determined to find out, and prove I could make the program in just 1 week or less! Low and behold, I did it! And in 1 day less then a week! I shocked even myself at how simple it was, and by comparison zbattle. I got the GUI for all windows made, settings dialog fully working, ini support fully working, game list window fully working, host and client windows fully working, all messages displaying and changing at proper times, even the game send feature! It is a fully working stand alone client like zbattle. With 1 day of my self allotted dev time left, I even worked on a couple other nifty features, though their not supposed to be enabled of course. From there, I thought about releasing a demo version with imposed limits to show off what I've done, limits being to keep people from regularly using it/asking for support. I decided against the demo release, as it serves no real purpose except to brag, stir up controversy, and was generally just tactless. In fact this dev blog will be the first time I've revealed the existence of this project to anyone. This project is of course unreleased, and will remain as such. The only way I might release it would be if zbattle servers went down again for a significant amount of time, permanently, or the possible but unlikely project merger of zbattle into Z-Net. I use a Windows XP style I custom made myself thats designed to look exactly like the default 3, except black/grey (perhaps I should post that at some point) . So ignore that as thinking its part of the program itself. This seems to be from earlier in my week of developing the project, as the "Game Name" column is indented. A bug I fixed before I finished it. 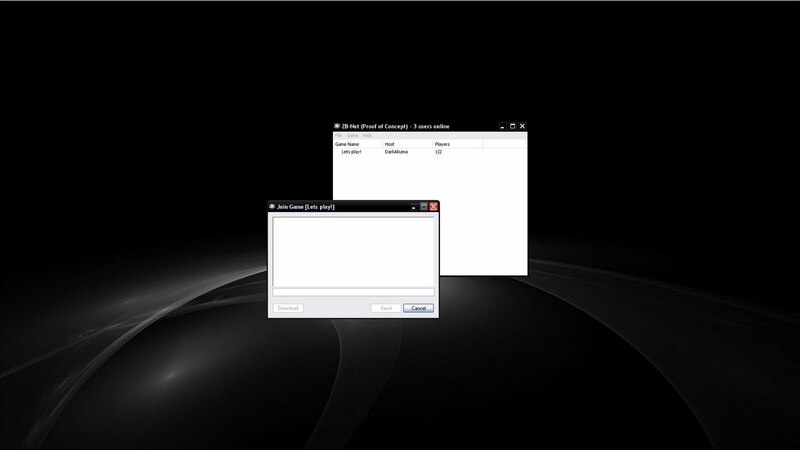 And the icon is a copy of the old one I used with the Z-Net 1.x mIRC combo pack. This pic I took after originally posting this. It shows the settings window. Not much going on. 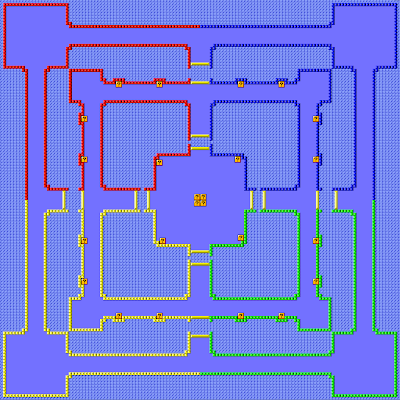 This is of course of a final build of the program. Its using a new icon I mocked up for it, and though you can't see it since I didn't feel like logging in 2 clients, the bug I mentioned is gone. This was being made shortly after development of the Z-Net 1.x project series stopped at 1.41. Due in part to enough users finding the combo of Z-Net + mIRC confusing, and part from someone actually stealing my work on the Z-Net mIRC script by just blatantly making a copy of it and renaming every reference to me or "Z-Net" inside of it to one of their own choosing, then posting it online as their own project making me realize how bad the forced open source nature of mIRC scripting really is. I decided if I wanted to continue with this type of project, I'd need to do it in something like C++ to code a binary package that's obviously more secure from theft, and I'll have greater control over making it much easier to install and use. At the time I had tinkered with C++ some for the Z-Band project, but undertaking a project like this was significantly more challenging for my experience. I took as many shortcuts as I could by starting with an open source IRC client (I don't remember which one. It wasn't a popular one). I customized the source around my vision for Z-Net as much as I could, and got some real bare-bones code implemented for launching ZSNES netplay. 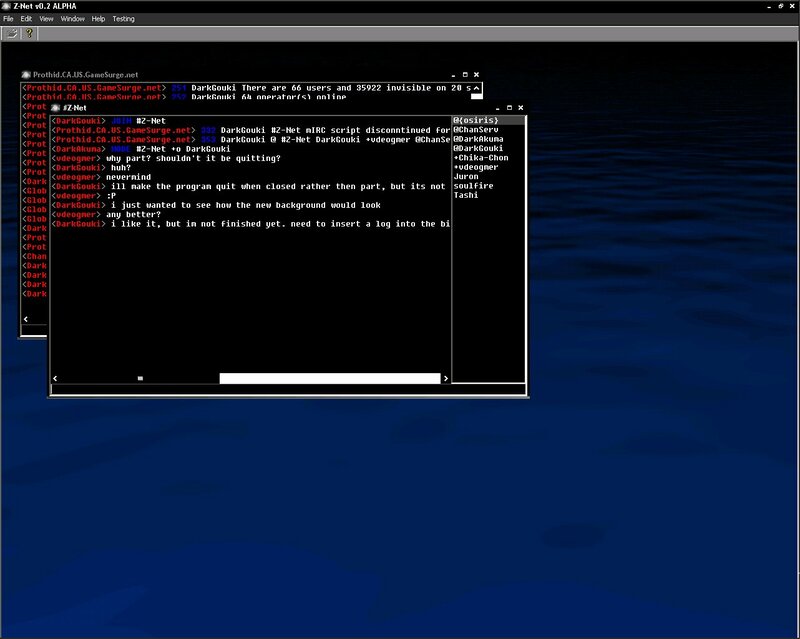 But soon got stuck on some issues using Win API to create a game list window. At the time, I didn't even know the term "Win API". It was all C++ to me. So finding help was hard, and I clearly saw my inexperience wasn't going to let me progress anymore on it. My dead end due to lack of skill, and my eventual reasoning that taking the source of what was probably a licensed IRC client and not planning to release the source with my changes, would be no different then the same type of theft that helped cause me to start the project in the first place, brought this project to a halt. I never even shared a binary with a tester/friend. I only released a couple screen shots. In December 2007, as odd as it was, my interest in Z-Net got peaked again. The program zbattle was still running, perhaps with more users then years before. 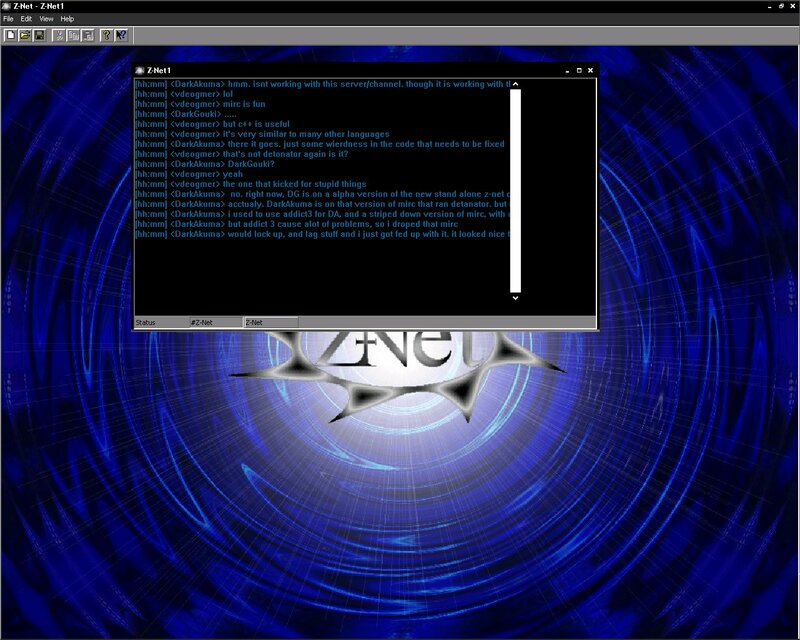 Yet somehow I still felt like bringing back Z-Net. I guess I came to the conclusion that "I just don't care, I want to do it for fun", and even decided I would revive it as a mIRC script. I grabbed the script from the complete rewrite I was silently making 3 1/2 years earlier, what I called the "new core", started polishing it up and worked out how to re-approach the issue of an interface. 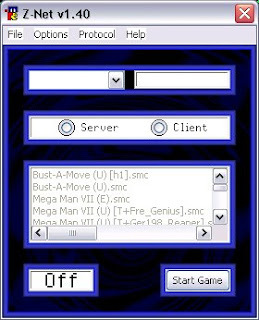 The interface was much more simple, made more sense, and was even more familiar to users of other online games. The ease of use (outside of bugs) was so much better, I can easily say that had I made it this way the first time around, Z-Net would have been a lot more successful. But that's not all. Z-Net 2.0 wasn't just a rewrite of the first. This one offered something very new. Support for more then just ZSNES. The new core I wrote was with the idea in mind that add-on ini's could easily be made to support launching virtually anything that supported netplay and command line parameters to access it. Sadly, ZSNES is still the only emu I know of to this day that supports command line parameters for it's netplay, and one of only a handful of emulators that doesn't just use the laggy bland eyesore that is kalleria. I realized that years before when I abandoned the project. This time I had an idea. 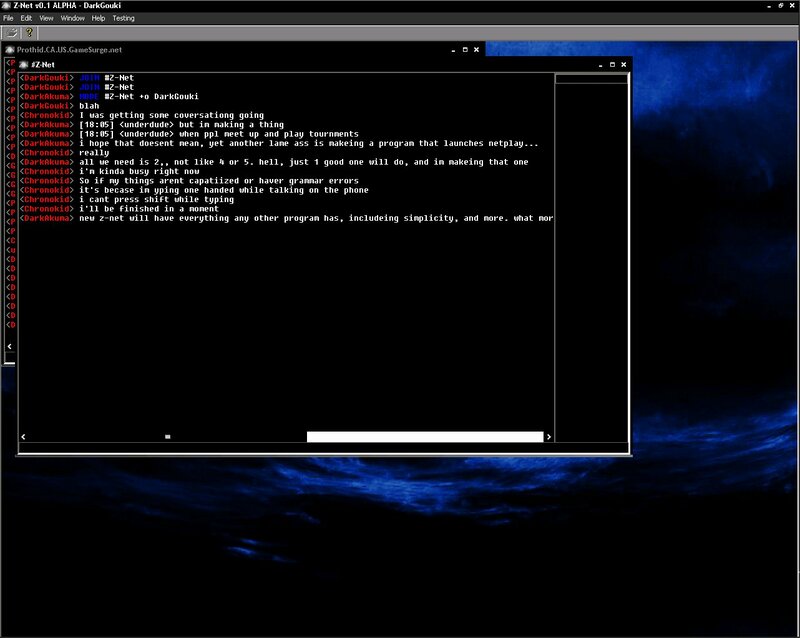 I would use the C++ I learned years before to make a mIRC DLL Z-Net can use to launch netplay games of those kalleria emulators using a less known about IP-to-IP version of kalleria. I did this by what I referred to as "macro launching". 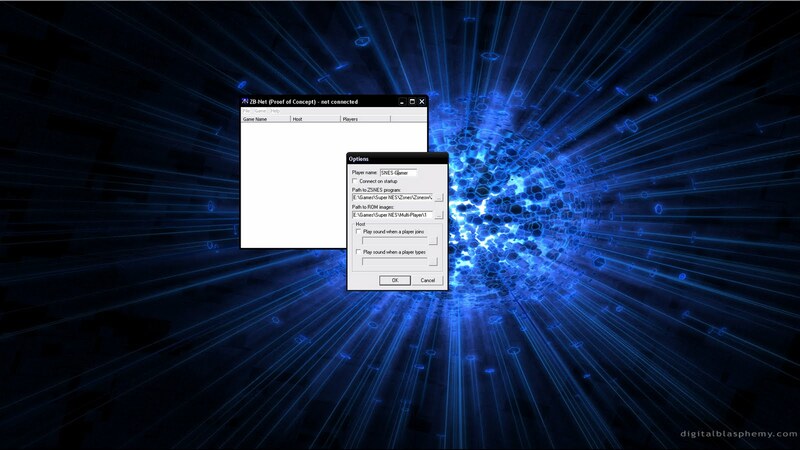 Once commanded to by the Z-Net script, the DLL would run a function run through a series of preset simulated key presses on the emulator window once the script ran the emulator and its window was found open. It actually worked quite well. 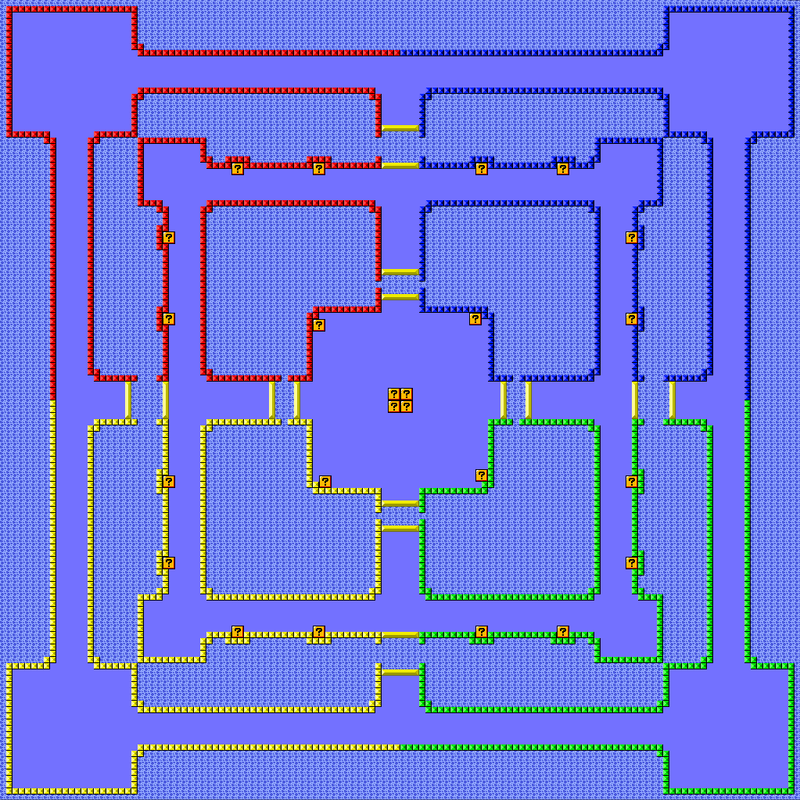 It seemed that although my C++ skills were lacking for the project years before, they could accomplish this! 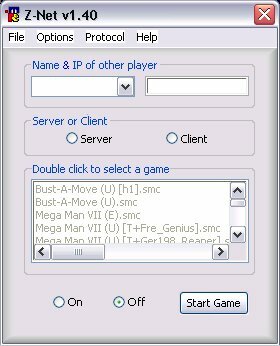 I added support for a number of emulators for systems including NES, N64, Genesis, and arcade/MAME. I was quite proud of this new version. Clearly superior to the old one, and arguably, but clearly to me superior to anything else comparable. But whats this? In the time since I abandoned Z-Net, I knew a couple other programers tried their hand at this type of project but hit their own roadblocks whatever they were. What I didn't know about was one that started around the same time I resumed work on Z-Net 2.0, by a C++ programmer more talented then I. I never crossed paths with the dev, though I swear he stole every idea I ever had. I think a formerly loyal Z-Net 1.0 user fed him information from a lot of the ideas I discussed among the channel community. Disheartened my ambition lowered. The community for these types of projects was/is to small to support 2 programs as I've learned, let alone 3. People only want to use one program. The community for SNES games was/is firmly in place in zbattles hands, and the community for other systems netplay is almost non-existent. I realized it would take far more work then coding Z-Net 2.0 and the DLLs themselves to establish any community for my project, and I think the dev of that other program realized the same. Both our projects seemed to die before they ever took off. At this point I realized the situation of building/maintaining a project like this. The community is to small, and isn't going to grow much. In the years since I first took a crack at the project, single player emulation had moved more towards being run on modern consoles like wii and xbox. Single player emulation supplies the biggest percentage of users who would make their way into this type of community. And with less people using PC emulators, growth of netplay emulation popularity is and will be low. These two major reasons lead me to choose to walk away from the project for good, as I decided trying to create a successful program like this just will never work, no matter how many and how good the features are that I add. I declared to myself, few things would ever tempt me to try a project like this again. I walked away from this project this time satisfied, as I had fun making it, and that's all I really wanted anyway. 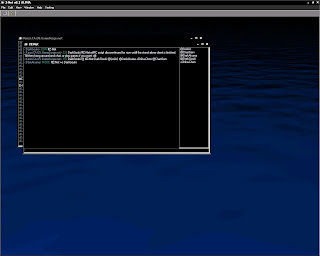 Z-Net is my first foray into coding/scripting, other then HTML for a couple websites. I started developing it in December of 2003. It's written in the mIRC scripting language, so it requires mIRC to use it. I was learning scripting as I was making it, and as such it had a lot of bugs in it, and a generally sloppy or not well thought out design. 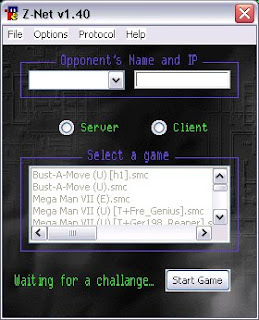 The aim of the project was to make finding and launching IP-to-IP netplay games with the SNES emulator ZSNES easier, and to fill the void left by the comparable program zbattle after it's server was down for many months with little to no sign of returning. I felt zbattle lacked a lot, such as features and community, and strove to not only make it as good, but make it better and give all those players without a way to play quick easy games a new home. Sadly for the project, the wind got knocked out of it's sails by the return of the zbattle servers after I was mostly done with it in early 2004. 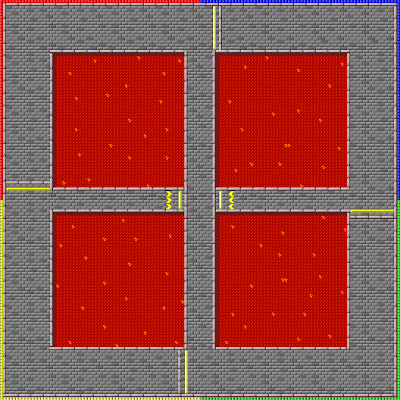 Due to mostly being done, and the advancements I made in Z-Net over zbattle, I decided to continue development. Late in February 2004 Z-Net had it's first official release as "Z-Net 1.0". The project gained several loyal users, but failed to grab more then 25% of the type of users interested in this type of project. In part due to the strange design of the Z-Net interface, bugs, slightly complicated installation, peoples strange misguided aversion to mIRC, and stability/relative ease of use of zbattle. I continued to try and refine the complexity and messiness of the interface more, as well as offer some simpler installation methods, while also adding more features. Eventually I changed the core of the code around a bit, and found users seemed to prefer a new "Quick Launch" option I introduced, that while quick and easy, lacked features and bypassed the bulk of the interface completely. I then came to realize my failure of the project and it's grim future. Looking back, I'd have to say my blunder was that I designed Z-Net to be easy for me to use, rather then looking at it from other peoples view and designing it for them. Combined with just my inexperience with designing such projects when I started. Z-Net's script grew to large to just not use what I've already written, so I turned a blind eye to any remaining issues with it's design and kept plowing forward thinking adding more bells and whistles will solve everything. I can now easily say it didn't, and by v1.41 I started accepting some of the issues. 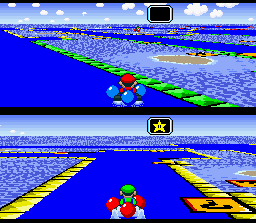 I started working on several other side projects, mainly Super Mario Kart hacks, Z-Band, and more notably a complete redesign of Z-Net itself. The complete redesign was something I kept quite about, and in part due to that, I ended up losing interest in the Z-Net project completely. The other part being that it became glaringly apparent that Z-Net's "open source" release format as it were, was very troubling in terms of theft and users being able to tinker with the script and possibly impair theirs and other users ability to play. The mIRC scripting format offers no form of compiled binary, so Z-Net being left as being developed as a mIRC script started seeming like a serious issue. 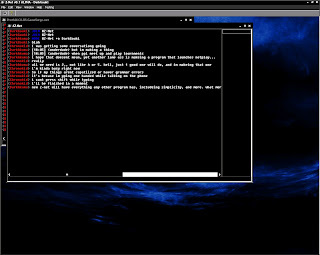 I realized that it would be a great help to learn more C++ to continue the project, and started doing so with plans to make a complete "stand alone" client that offered all features of the mIRC script and chat interface similar to mIRC itself, but as a compiled binary not involving mIRC at all. Learning went fast for me, but not fast enough. My plans exceeded my experience, and despite taking shortcuts using source I found available on the internet (of which I think was licensed), I was just in over my head. Convinced that a complete rewrite, and one in C++ was the only viable option to continue the project, the project hit a dead end and I lost interest completely. 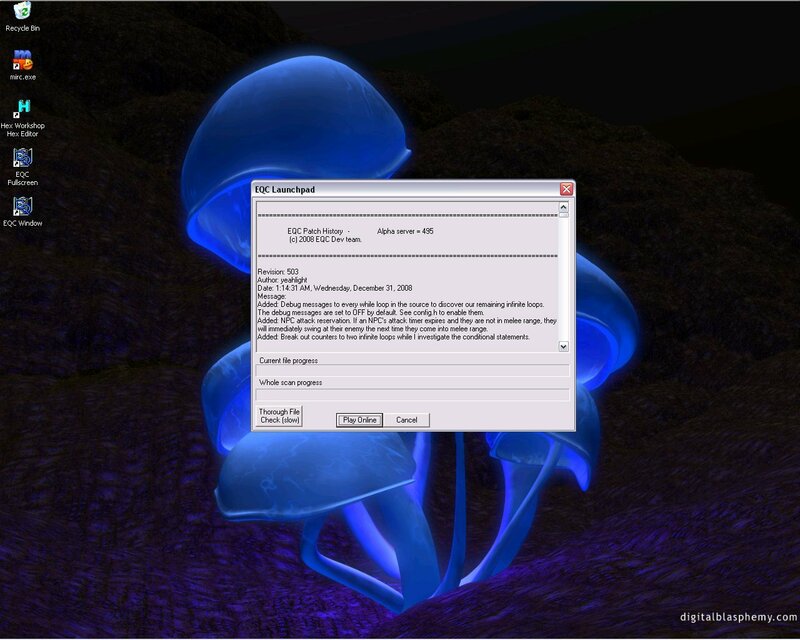 EQC Launchpad is a project I started in 2009, while waiting for the long needed return to Classic Era EverQuest that the EQClassic project hoped to produce. Excited and impatient, I wanted to help like many others. Though unlike many others in that community, I had at least some skills towards doing so, even if it was just some minor C++ ability. Due to my low level of skill, I saw that I would easily get overwhelmed at the scope of the server project had I offered and accepted an invite to join. Still I wanted to contribute, and after tinkering around with my old EQTrilogy discs, I ran the patcher. Something that wouldn't be needed once the EQClassic project was finished, as for one if it did work, it would just update the classic EQ files to modern expansions, and even if it could be pointed elsewhere, the files it would download would be illegal to distribute. The patcher, while probably easily forgettable by most, was still part of the "Classic EQ" experience. I then realized I could create a new one that looks exactly like it, seemingly functions exactly the same, and can have it just download a handful of legal and very needed files that will help users install classic EQ and join the server more easily. An example file being the little "eqhost.txt" file. Its a very important file for any EQ server emulators, as without one pointing to the emulators server, a user can't play there. I don't understand how editing/creating a new eqhost file could be difficult, but saw people often get intimidated by having to dig into their EQ directory to change something like that, or the eqclient.ini. Also even though an update to the client would never be released, server side things get changed all the time so patch news will still happen. So a new eqnews.txt file is added to the list. 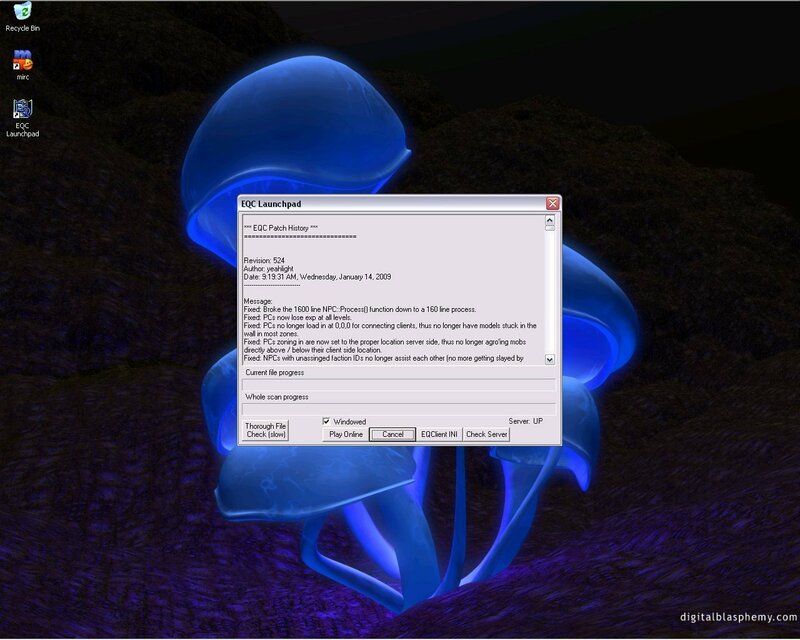 While arguably not classic, EQWindows was often used by people during the classic era, me one of them, and as modern MMOs all now adopt playing in a window and being able to alt tab is a necessity. That's another 3 files added to the list. These 5 files were enough to me, to decide making the program was worth it. Now the question was, was my skill up to it? I figured I could learn more as I go and if I got stuck at some point and had to give up, oh well. It's just a hobby and I'll have fun either way. I started work right away, and wow. While I still didn't consider my skills very good, I had underestimated how much I've learned from past C++ projects, as coding the project went relatively easy. I got the program working, connecting to a remote server, downloading a file/command list, checking its local files against that list to see if it need to download any new files, and more. I even added extra unplanned features like an editor window interface for the eqclient.ini, a file scan that checks all the important game client files for corruption and patches them from the users EQTrilogy disc if needed. An IRC chat window, and Login/World server status indicators. As its still unreleased, there are a couple other features I've added but won't go into as they may not be in the final version. The program shaped up quite well, and even became adopted/endorsed by the EQClassic team of which I eventually joined. Shortly after that though, advancement of my project slowed as there wasn't much left to do on it, and EQClassic itself still had no ETA in sight. I've worked on it very little since the first couple months when I hammered out the bulk of the program. It has little use in the current testing phase, but will have more use at a later time. Look forward to this and the EQClassic project in the coming years! In my time away from the Z-Net project, I frequented channels and forums of the GameCube scene. It's at this time that I made this program. It's simple, but not overly useful. Action Replays for GameCube came on a disc like game, yet the entire 1.4 gigabytes of the disc wasn't needed. The actual size of the Action Replay code was just a few megabytes. This program simply located that binary, extracted it and saved it as a .dol file to be use the one of sever method to run such a file on your GameCube. Over the years I've developed various things that I've released on the internet. I decided to make this blog as a portal for those things, as every other free web server I've ever used ended up being unreliable. At the moment I don't have anything I'm actively working on, but that could change at anytime. The closest project I have to being active is EQC Launchpad, but that's mostly finished, and any further development of that project is on hold until the EQC project itself has advanced more. I'll post links and details about my past projects over time, but for now I'll sum up what I've done. I started with mIRC scripting creating a promising, yet failing to grab much interest, netplay portal for use with the Super Nintendo emulator ZSNES. As well as probably a handful of other, much smaller/less useful scripts. 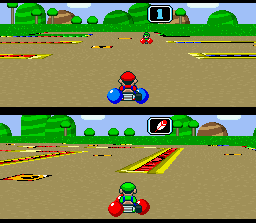 During/after that project I made a few ROM hacks for Super Mario Kart, to help draw some users. Several years later I decided to give it another shot learning much from my previous attempt. I finished up the script of a complete rewrite, creating a much more stable and versatile script. Sadly it seemed that such a script/program just had it's limits in terms of appeal, and that combined with a couple other similar "rival" projects being developed, I felt I should stop it's development before I got anymore involved. Some time after that, I was following the EQClassic project, and due to my excitement I decided to work on a complete replacement for the patcher for that game. That project is currently privately released only. There have been other, generally unreleased projects I've had over the course of those years, and I'll list those here in time as well, though probably only with details and screenshots. For now check out these website's if your interested in any of these topics.